If you bet Java's War in the grade I Toyota Blue Grass Stakes, you probably let out a groan when the 3-year-old War Pass colt missed the break. But Java's War is one of a growing number of horses that have overcome such starts to win races at the Keeneland spring meet. Last-to-first victories haven't been unusual on the Polytrack or turf course (see Gathering, War Dancer, Fast Bobbi J, Pisgah Station, and Perfect Praise.). "I wasn't worried (about the slow start)," trainer Ken McPeek said after the April 13 Blue Grass. "He's not a horse that's quick out of there." The morning of April 14, McPeek reported Java's War "came out of the Blue Grass fine." As for himself, McPeek said via Twitter: "The trainer is exhausted." With 122 qualifying points Java's War, owned by Charles Fipke, is assured a spot in the May 4 Kentucky Derby Presented by Yum! Brands (gr. I) at Churchill Downs. Despite criticism from industry insiders about synthetic surfaces, the Keeneland product continues to more than hold its own in the national marketplace. Total pari-mutuel handle on the 12-race Blue Grass Stakes card was $21.11 million, just shy of the all-time record of $21.27 million bet on the 2012 Blue Grass program. Reported attendance of 37,161 was the second-largest in track history behind the 40,617 reported for last year's Blue Grass day. In comparison, the 12-race all-dirt program at Oaklawn Park for Arkansas Derby (gr. I) day April 13 generated total handle of $12.77 million. On-track handle of $3.55 million at Oaklawn, where attendance was reported at 66,158, topped the Keeneland on-track number of $2.44 million. Keeneland director of racing Rogers Beasley said Keeneland has been out-handling the other major tracks each day during its spring meet. Through April 13, with one more day of racing compared with spring 2012, all-sources handle was $80.86 million, up 22.67% from $65.92 million last year, Keeneland officials said. On-track handle for the first seven days totaled $10.41 million, down 3.77% from 2012. Cumulative attendance was 135,673, up 5.79% from 128,243 last year. Construction on Versailles Road, the primary artery for Keeneland, appears to have had minimal impact thus far. With 2012 Horse of the Year Wise Dan having won his 2013 debut, trainer Charlie LoPresti is awaiting the return of Successful Dan, the older half brother to Wise Dan. Successful Dan, a 7-year-old Successful Appeal gelding, hasn't raced since his second-place finish behind Fort Larned in last summer's grade III Cornhusker Handicap. He suffered a ligament strain in his left front ankle but has been training for his return with solid works at Keeneland. Options for Successful Dan are the April 21 Ben Ali Stakes (gr. III) at Keeneland or the May 3 Alysheba Stakes (gr. II) at Churchill Downs, LoPresti said. Successful Dan won the 2012 Alysheba over Fort Larned and Mucho Macho Man. "We will know (April 16) if he is going to go in the Ben Ali or the Alysheba," LoPresti said. "He is going to breeze one more time, and then Dr. (Larry) Bramlage wants to look at his X-rays one more time. If the inflammation is gone, he'll go in the Ben Ali. If not, we will wait." Successful Dan has won seven of 11 starts. He is undefeated in four starts on the Polytrack at Keeneland, and would be undefeated in four starts on the dirt at Churchill had he not been disqualified from victory in the 2010 Clark Handicap (gr. I). One of the more popular horses at the spring meet is Perfect Praise, who won a $20,000 claiming race from last to first after a poor start April 11. The 3-year-old Pleasantly Perfect filly, then owned by Ken and Sarah Ramsey, attracted 17 claim slips, not a record at Keeneland but unusually high. The 17 slips were split into two shakes of nine and eight, followed by a shake between the two winners, said a trainer involved in the shake. Perfect Praise went to Keeneland-based trainer Kellyn Gorder for owner L. Barrett Bernard. Through the first seven days of the 16-day spring meet, Ken and Sarah Ramsey topped the owner standings by wins with nine, one shy of their top of 10 during the 2012 spring meet. The record of 12 is held by Calumet Farm in 1941. Through April 13 the Ramseys had 33 starts with nine wins, two seconds, and four thirds for earnings of $350,971. Augustin Stable was next in line with four wins in 10 starts. 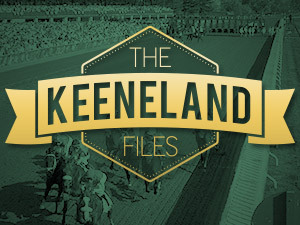 "The Keeneland Files" will appear at BloodHorse.com twice a week, Wednesdays and Sundays, through April 28.